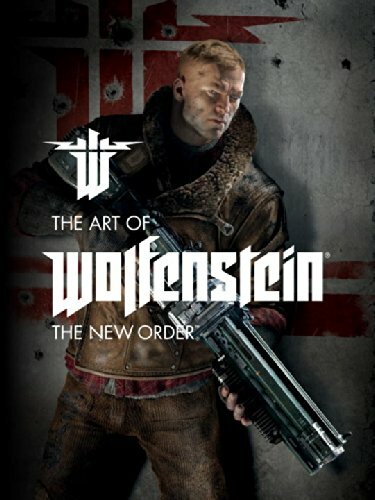 The Art of Wolfenstein: The New Order is definitely one of top artbooks for 2014, and it's one amazing video game artbook. I was caught by surprised at how good it is. My copy of the book came with its own cardboard packaging. Usually books come shrink-wrapped or not wrapped at all. Publisher Dark Horse certainly does not want the book to be damaged during shipment. By the way, there are 208 pages instead of 184 that are listed on some websites, even on Dark Horse's website. Nice little bonus. This is an oversized artbook with a thick cover and pages. Good binding too. Inside the concept art are split into 16 levels. For each level, we are shown the characters, environments, props, weapons, robots, vehicles and enemies. They are revealed in order just as in the game. The art is incredible to look at. It's quite astonishing the amount of detail they put into the concept art. The resolution and definition on the characters are down to the pores. What you'll notice is this level of meticulous detail is applied throughout the book. Robot designs are fantastic. For the 3D models, I can't even see or feel the polygonal look. These machines looks like very high polygon count models. In short, they look great. There are a lot of robots, mechanical vehicles, props, and quite a few metal hounds. The designs feel as if they have weight, and you won't want to stand in the way of any of the robots. The environment artworks are beautiful. The artists really nailed the lighting and mood. Many are painted, and I think many are painted over 3D models, but you would feel that it's painted with lots of details rather than that it's modelled in 3D. In addition to art of the actual assets in the game, there are pre-development concept art, basically artworks that are used to pitch the vision of the world and game play. The commentary talks briefly about the designs and character profiles. This is a amazing artbook. One of my favourites for 2014.